Disposing of old refrigerators is potentially harmful as the Freon coolant can damage the ozone layer. Discuss old refrigerator removal with your local council. When you need the job done right by a professional fridge mechanic, call do-all Appliance Service for all your Westinghouse and Fisher & Paykel fridge repairs on 1300 366 365. Do all Appliances is accredited by the Australian Refrigeration Council (ARC) – Refrigeration trading authorization number AU07324. Can you imagine what your life would be without a fridge? You would probably be able to handle a couple of days, but you would certainly get fed up with running to the shop every time you feel hungry or thirsty. Unfortunately, such risk really does exist. You can end up without a fridge if it stops working. In order to prevent that from happening, you need to treat it the right way, but sometimes even that might not be enough. Depending on the type and brand of the refrigerator, it can serve you well for years. But, some refrigerators are simply not made to last for a long time. That is why it’s fair to say that the fridge problems start even before buying one. If you don’t make the right choice, you can expect a lot of problems with the fridge in the future. If you spot some of these issues, there’s no time to waste. You need to call 1300 366 365 and tell our team what’s going on. They will do their best to come around as soon as possible and take a closer look at the fridge. 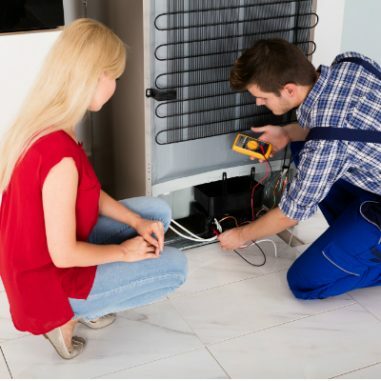 You can be sure that our team members have the tools and the knowledge to take care of any refrigerator issue, no matter how difficult it might be. In order to ensure that no big problems happen with your fridge, there are some things you could do. Actually, the solution is very simple – treat your fridge the right way and it will serve well. These are just some of the tips and tricks that can add a few years to your refrigerator. To learn more on how to maintain it, feel free to give a call to Do-All Appliance Service.